Map 14 Kinkell Braes, St Andrews. Figure 8 Saddleback Anticline, Kinkell Braes, St Andrews. The ridges are composed of sandstones, one of which, on the right limb of the fold, is cut by a small fault. Walking distance 1.5 km on path, 1.5 km on rocky shore. This is a straightforward elementary excursion introducing a variety of geological phenomena. These include: (1) common sedimentary rocks; sandstone and shale in particular and also mudstone and limestone; (2) common features of sedimentary rocks such as cross bedding, ripple marks and joints – these are widespread; (3) fossils which occur in certain beds only, mainly those deposited under marine conditions; (4) folding and faulting which are well displayed; (5) a landslip. 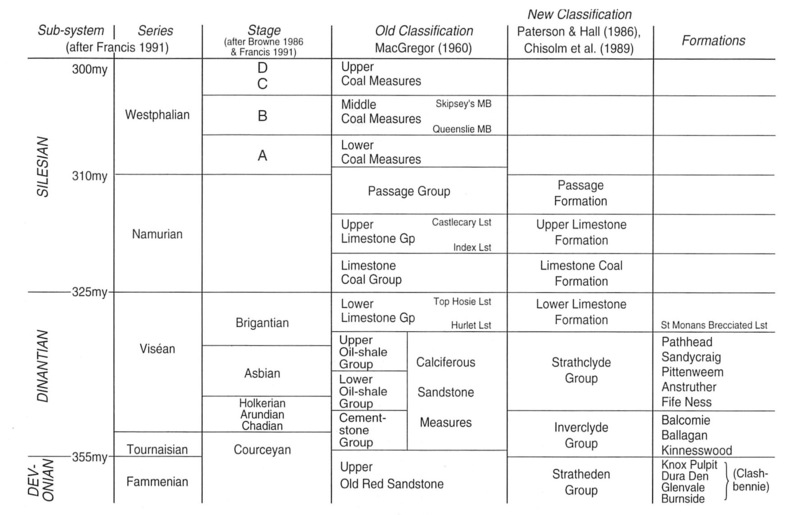 The beds belong to the Strathclyde Group of the Carboniferous System (see (Table 4)) and show many signs of having accumulated under shallow, freshwater or deltaic conditions with occasional marine incursions. Igneous rocks, though present, are rare and highly altered. Among much more recent features are the late-glacial and postglacial raised beaches, the Maiden Rock sea stack and erratic blocks of dolerite left behind by ice during the Quaternary glaciation of the region. At the present day, a still younger beach is forming complete with its wavecut platform cutting across rocks of varying hardness on the shore. Since many of the exposures are in the intertidal zone, the excursion should be undertaken as near to low tide as possible. Route From the public car park at the Albany Park Flats (near the Gatty Marine Laboratory) at the East Sands, St Andrews, follow the shore path which runs southwards for 370 m across a low raised beach (with the Leisure Centre to the south-west) and then climbs up the cliff at the beginning of the Kinkell Braes. Halfway up the steep part of the path observe the loose sand and mud that have fallen down from above. This is sediment from the late-glacial raised beach at the top of the cliff on which the lower part of the caravan park is situated. The sediments contain shell fragments not very different from those on the present day beach. Contrast the weathered and grassed over state of the cliff at the back of this raised beach with the fresher cliff at the back of the younger, postglacial raised beach and that at the back of the present day beach. Follow the coast path along the top of the cliff for 200 m. At the eastern end of the caravan site is a slow-moving, active landslip. It can best be viewed from the eastern side from the top of the shore cliff. Much of the material slipping towards the beach is shale and the toe of the slip extends below high water mark (HWM) on the beach, where it is eroded by the sea thus promoting further slipping. Large blocks of sandstone, soil and bushes can be seen on the head of the slip and, from time to time, the curved fault planes on which they move. In a more general view of the shore below, a U-shaped outcrop can be discerned with the top of the U opening to the south-west, i.e. obliquely into the cliff This is a syncline: i.e. a trough-shaped fold in the rocks with the beds on the northern side dipping towards the cliff at 30° and those on the south-eastern side dipping into the trough much more steeply at 70°–80°. Further east, the strata (beds) can be seen to strike (general trend or run of the beds) parallel to the cliff until at the Maiden Rock they are folded into another syncline. Follow the path eastwards until at a point 180 m beyond the Maiden Rock, where the path turns south up a slight hill, the rocks on the shore can be seen to be folded into an anticline (the Saddleback Anticline): i.e. they are arched upwards and dip outwards on either side at 30°–60°. Beyond the anticline the beds again dip east, until after 270 m they are sharply folded into a small syncline near LWM. Immediately east of this, a semicircular dome-like structure in the rocks can be seen from the cliff top – the Kinkell Cave Dome. Now follow the path down the cliff to the postglacial raised beach and to the shore itself. The remaining part of the excursion can now be carried out by walking back along the shore to the East Sands. At this locality the strike of the beds is N–S and the dip is 25°–40° E. The sandstones are yellow to buff in colour and vary from massive beds showing trough cross bedding to thin-bedded sandstones, often with ripple marking and a tendency to break into blocks along joints. The finer-grained, softer, grey, shaly beds have been eroded out by the sea to leave trenches on the shore. These are often partially filled with boulders or sand thus making it difficult to examine the shales. Halfway down the shore notice an ENE–WSW trending fault which cuts the sandstones and displaces the seaward outcrops east. This is a dip fault, i.e. it runs parallel to the direction of dip of the beds that it cuts. By examining closely the line of the fault, a creamy-buff rock can be seen in the fault plane and pinching out locally along it. This is 'white trap': an alteration product of a basalt dyke that has been intruded along the line of the fault. The original dark coloured, basic igneous rock has undergone considerable chemical change owing to the incorporation of much CO„ produced from the carbon of the country rock. This originates in Carboniferous plant debris, buried in the sediment when it was laid down. The resulting carbonate-rich 'white trap' bears little resemblance to basalt (elsewhere a gradual transition from basalt to white trap may be seen, e.g. Excursion 15, Location 3). The fault is difficult to follow through grey shales and sandy shales, but can be located again to the west where it cuts a thick sandstone before dying out. When this sandstone is followed by eye up the cliff, Kinkell Cave can be clearly seen. Beyond the ridge on the shore formed by the thick sandstone is the Kinkell Cave Dome in which the beds dip outwards to the north, east and west. The arching of the beds over the dome can be seen in the cliff behind. 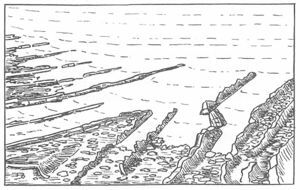 Low on the shore and cutting the thick sandstone, a small volcanic vent, filled with white trap, is exposed (Balsillie 1920 (b), p. 81). The vent measures 45 m by 60 m and has an irregular outline with a narrow tongue extending south into the country rock. A separate part of the vent on the east of the sandstone ridge and lying a short distance offshore is filled with volcanic ash or tuff containing fragments of sediment. Follow the thick sandstone westwards from the cave round the dome and into the sharp syncline where, partly because of movement along a small fault, it stands up in a V-shaped ridge of particularly well jointed sandstone. 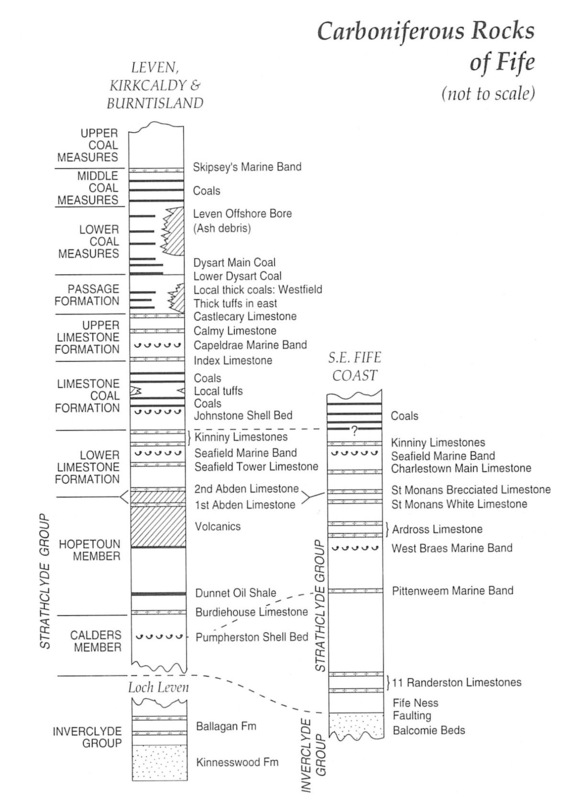 The fossiliferous limestone and shale form the St Andrews Castle Marine Band (Forsyth and Chisholm 1977, pp. 37–41), the fossils including Productus, Aviculopecten, Myalina, Naiadites, Euphemites, fish teeth and abundant crinoid ossicles. The small fault which cuts the sharp syncline low on the shore at Locality 3 can be seen cutting this marine band a short distance below HWM, but the throw here is only a few metres and a short distance further west the fault dies out. Now walk westwards across 60 m of east-dipping strata consisting mainly of sandstones, but which have been eroded out to form trenches, now partly filled with boulders. Brachiopods, bivalves and gastropods can be collected from the shales and also weather out on the surface of the limestone. Crinoid ossicles and rare crinoid cups occur in the limestone. When the Witch Lake Marine Band is followed up the shore towards HWM on the eastern side of the Saddleback Anticline the outcrop is cut off by a NW–SE fault which dies out to the north-west. Drag of the beds against the fault can be clearly seen and indicates a sinistral movement, i.e., the beds on the side opposite the observer have moved to the left. Forty-five metres west from the Witch Lake Marine Band examine the axis of the Saddleback Anticline. The beds dip at 45° E on one side and 45°–60° W on the other, while at the 'nose' of the anticline they dip at 10°–25° N. This is the plunge of the fold. Notice that individual beds can be followed round the nose of the fold from one side to the other and on looking into the cliff behind, some of the thick sandstone beds can be seen arching over the fold. The Saddleback Anticline is cut by another NW–SE fault which, though it has its greatest displacement on the western side (or limb), cuts right across the middle of the fold. This fault also has a sinistral displacement and since it displaces the fold axis, can be described as a tear fault. The succession already examined on the east side of the anticline is now repeated on the west side with the brown-weathering sandstone again forming a prominent ridge 50 m west of the fold axis. The Witch Lake Marine Band also reappears, but is obscured at HWM by a strike fault, i.e. one that runs approximately parallel to the strike of the bed that it cuts. The line of this fault is marked by a gap in the brown sandstone ridge, the sandstone having been shattered by the faulting and thus made more susceptible to erosion by the sea. The next 75 m of the shore are occupied by strata, higher in the succession than the Witch Lake Marine Band, which are folded into the Maiden Rock Syncline. On the eastern side of this fold the beds dip at 60°–80° towards the axis of the fold. The western limb has been steepened so much, however, that the beds have been overturned and now dip at angles of up to 130° towards the east, i.e. they dip west at angles as low as 50°. In this fold too, individual beds can be followed round the nose of the fold where the plunge is about 35°N in approximately the same direction as the Saddleback Anticline. 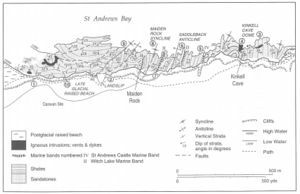 The Witch Lake Marine Band reappears once more a few metres west of the Maiden Rock, but is poorly exposed at HWM where its course is marked by a boulder and sand filled trench. At this point notice the prominent Maiden Rock, an old sea stack standing on the remnant of the postglacial raised beach. It dates from the time when the sea level stood some 4 m higher than now and consists of vertically dipping sandstone, bounded on the east and west by bedding planes and on the north and south by minor fault planes. These planes of weakness were preferentially eroded by the sea thus leaving a sandstone pillar as an erosional remnant. A short distance north-west of the Maiden Rock, the Maiden Rock Syncline is abruptly cut off by a NE–SW fault, the course of which is marked on the beach by a trench filled with boulders and bottomed by shattered rock. For 180 m to the west, sandstones dip north at 25° until another NE–SW striking fault is reached. Notice also the gap in the cliffs formed by a landslip. 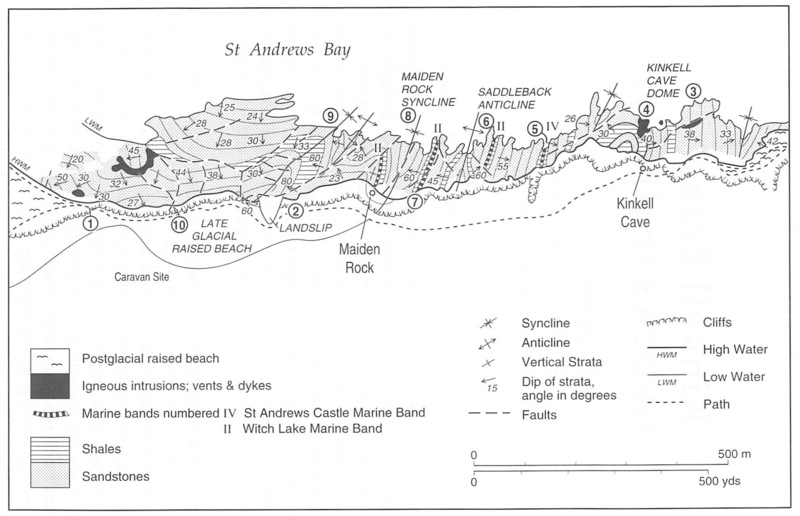 The first fault is believed to have a considerable displacement because the familiar marker horizon, the Witch Lake Marine Band, is not exposed again before the Castle at St Andrews, 1.5 km to the north-west. In the shatter belt marking the second of these faults, Balsillie (1920a, p. 76) records the presence of volcanic tuff intruded up the fault plane. This tuff is now almost totally obscured by boulders. Beyond this fault sandstones low on the shore are folded into a small anticline which is succeeded to the west by the prominent syncline seen earlier from the top of the cliff. Notice that the centre of the syncline is occupied by thick, trough cross-bedded sandstones underlain by grey shales with ironstone nodules and that preferential erosion of the shales by the sea has picked out the structure. The shales are in turn underlain by a thick series of sandstones. In the syncline, dips are as high as 80° on the eastern limb but, no more than 30° on the northern limb while the fold plunges south-west at about 15°. A series of small WNW trending faults, apparently associated with the intense folding, cuts the thick sandstones in the centre of the syncline. The shales on the other hand have deformed plastically round the more rigid sandstones. A fault at the foot of the cliff and running parallel to the shore, separates the syncline from the beds in the cliff which dip towards the WNW at 60°. Details of the structure are not known, but this is probably another tear fault. Notice the toe of the landslip, mentioned at Locality 2, where it spills onto the shore. Much of it is made up of soft shale. It has been moving slowly since 1982. From the landslip to the East Sands, a distance of about 0.5 km, the shore is largely occupied by sandstones. In detail a number of faults break up the succession and one of these is exposed in the cliff about 180 m east of the point where the path begins to climb the cliff. This fault, which is apparently a low angle one, downthrows to the east and drag of the beds as they approach the fault plane can readily be seen from the shore below. Secreted in cracks and faults in the rocks of this part of the shore are a number of small masses of tuffs, but usually these can only be located after intensive search. The most prominent is U-shaped with sandstone striking N–S inside the U and sandstone striking E–W outside the U. This particular volcanic vent has been eroded by the sea to form a trench about 3 m wide near LWM, but the tuff is completely covered by sand and cannot be seen without excavating. A white trap dyke, seldom more than 60 cm thick, runs westwards from this vent but is largely covered by sand. Well developed ripple marks can be seen in thin-bedded sandstone outcropping in the cliff below the path where it rises from the postglacial raised beach. Towards the western end of exposures on the shore, the strike of the beds gradually swings round to the NW–SE, the general dip remaining about 35° towards the south or south-west. Just before the end of exposures at HWM, the beds are cut by another fault trending NNE. Across this fault there is a pronounced change in the strike of the beds. Sandstones outcrop on both sides and the displacement is unknown. BALSILLIE, D., 1920, a. Descriptions of some volcanic vents near St Andrews. Trans. Edinb. Geol. Soc., 11, 69–80. BALSILLIE, D., 1920, b. Descriptions of some new volcanic vents in East Fife. Trans. Edinb. Geol. Soc., 11, 81–5. KIRK, S. R., 1925. A Coast section in the Calciferous Sandstone Series of Eastern Fife. Unpublished St Andrews University Ph.D. thesis. This page was last modified on 23 February 2019, at 10:03.